According to homeopathy, water has a memory in which it holds the medicinal effects of the actual substance and it transmits those effects into the patient's body when consumed. This is the mechanism of homeopathy (info taken from Wikipedia). 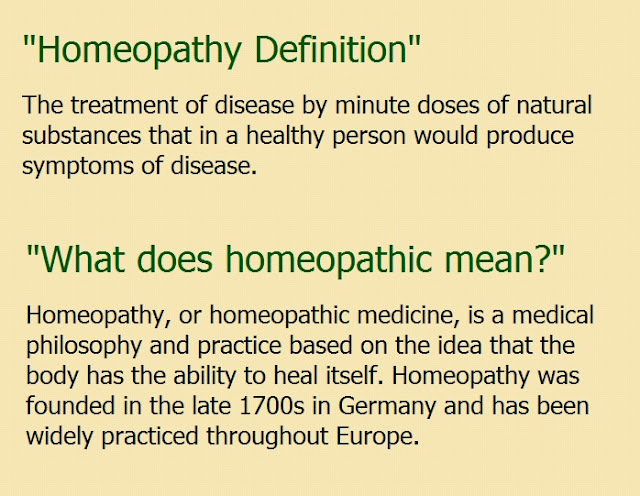 There are several homeopathy definitions are circulated on the internet, every definition has it is on the theory of how it works. You will explore the full meanings of homeopathy in this article by reading certain useful examples; besides this page, you can discover hundreds of real homeopathic case examples on our site. The homeopath's chief concern is the vital force. The meanings of homeopathy may give an idea of this vital force from the example of an egg. Inside the egg, there is a semi-fluid substance which too many serves no other purpose than food. But give that egg some time and a little warmth, and from that undifferentiated mass of substance comes out a bird with a full structural organization, the bones, the beak, the kidney, the liver, the veins and the arteries. Surely somewhere, your test-tube or any instrument cannot find out where lay embedded a vital principle which beat out that chaotic substance into a complete live animal, active and intelligent, with the power to transmit the urge of procreation. The process of man's creation is not otherwise. A homeopath especially a beginner, should very often ponder over this fundamental aspect of human life including that of himself and of other men; and only through repeated meditations, he can be sure of his ground as a homeopath, and what more he can have a glimpse into the deeper aspects of the connecting link between the creation and the Creator. There is a general perception that Homoeopathy is backdated system of medicine. This is very funny. We have to remember the actual fact is that, literally Homoeopathy is the latest invented system of Medicine. You also may say that this is the only form of contemporary or modern medicine, invented only 250 years back. And the most important thing is that the modern science is very much unable to explain that how Homoeopathic Medicine works on the human body. The paradox is so called modern science can't ignore its efficacy or relevancy but they are a total failure to give a proper and authentic evidence for the mechanism of action of Homoeopathic medicine upon the human body. Scientists only giving various hypotheses like Nanomedicine, energy medicine, the memory of water etc. but we medics strongly demands to the scientific fraternity to discover a definitive conclusion about the Mechanism of this latest form of medicine for the benefit of humanity. From the time of origin of Homoeopathy by Dr. Hahnemann till today, it has survived the tests of time. In many countries, homoeopathy has been recognized as an authentic system of medicine. Today, more and more people are becoming aware of it and are experiencing its wonderful cures. Its phenomenal success has been witnessed and appreciated in all over the world. The WHO has recognized homoeopathy as an accepted system of medicine and as the second largest system of medicine in the world. However, homoeopathy has been a victim of a constant onslaught from various agencies all around the globe against time to time. The fact is that homoeopathy does not fail; it is a homoeopathic practitioner who fails. We must avoid the ignorance of Section 153 of the Organon which says that we have to prescribe on uncommon rare strange or peculiar symptoms. Failures are because many have taken homoeopathy as a backdoor entry into medical practice. Homoeopathy is not to do away with the knowledge of diagnosis and differential diagnosis. When a Physician is aware of common symptoms of disease then only he will be able to understand what are uncommon and work out the cases. Thus, here encyclopedia of common and uncommon symptoms affords excellent help. The basic problem our Homoeopathic fraternity is we never want to realize that without unity and cooperation of each other we cannot survive and sustain, because Market economy is against Homoeopathy as they cannot do much unethical profit by selling Homoeopathy , Big Media houses also do not promote the success stories of our system of medicine, Government is also very indifferent to this system of medicine, which is working in grass root level very efficaciously without getting any recognition and real publicity. So in this context where we have less monetary support, less media support, if we do not throw our personal Ego, idiocy and contradiction of each other, then we cannot save our pathy as well as ourselves. Yoga can be as it is popularly conceived of in the west, a system of exercises for mental and physical health including meditation and breathing. But there comes a point in yoga when your whole way of being becomes the yoga. You used to do yoga from 5-6 ever evening on your mat at home, or at the studio. Now you are participating in your yoga all the time, on your drive into work, while you wait in line at the checkout at the grocery store, or even typing up a Facebook post in your spare time. Then you have stopped doing yoga for you have become the yoga. You are yoga. A pregnant lady in a village went to town (where her sister lived) for delivery. The doctors in a nursing home after examining her declined to admit her because instead of descending, the uterus was in the upward position. She was then taken to the government hospital. Upon examining her, even they said that a major surgery had to be done and since the senior surgeon was not available they would not admit her. She came home weeping. It was solved by single remedy and a single dose within an hour normal and safe delivery result. “Upward, uterus seems to go: Cimicifuga." I gave her Cimicifuga (Actaea racemosa)-10M, one single dose. Within minutes she felt the uterus coming down to its normal position; and also developed labor pains: so, was rushed to the hospital. This time, upon examining her, the attending doctor said that everything was normal and so admitted her and it was a safe and normal delivery! I have seen many of the homeopathic doctors. They are good no doubt but they aren’t good at treating every disease. I have a disease that no one has been able to treat. I am treating the disease myself and it's working. What I think is each doctor should come to know about the diseases and its severity rather than just knowing how to treat the symptoms. The experienced doctors usually come across many diseases by as the untreated allopathic patients come to homeo doctors along with their termed disease. That’s the request to all the homeo doctors to have much knowledge about the allopathic diseases so that they could treat the patient well. Because homeo medicines are way more powerful than allopathic ones that are the only reason patients run behind it. I believe homeopathy works in a different way. It depends on the symptoms of the patient and works only when the remedy suits the patient. A homeopathic remedy consists of a very small amount of active ingredient and no active ingredient diluted in water. But there's no scientific evidence of homeopathy. But a western medical system is science-based. Hence, western medicines are supposed to cure the diseases directly. So if you select allopathy, self-medication might be successful. But in homeopathy, self-medication is not possible, I believe, unless you are a homeopath yourself!! Homeopathy is impossible without a homeopath. Though the concept is based on "pseudo-science", homeopathy does work, no doubt. Millions of patients are getting benefitted by homeopathy. Patients often ask me that should they take ‪Homoeopathy and ‪Allopathy medicine simultaneously. The answer is yes. The patients who are taking allopathic medicines for depression or Diabetes are significantly responding to Homoeopathic medicines for critical illnesses though diabetes and hypertension can be well treated by homoeopathic medicines. However, we have to remember there is no fighting off an inimical relationship between Allopathy and Homoeopathy. The aim of both systems of medicine is same, serving the Humanity. Basically, Homoeopathic medicine is nothing but an energy medicine. Te mechanism of action is always been explain by Physics, Whereas mechanism of action of Allopathic medicine is been explain by Chemistry. This is the basic different. So far the actual mechanism of action for Homoeopathic medicine is not known to the world, as because the contemporary scientific understanding is unable to explain it. Though lots of hypotheses are there in support of its workability but we all have to remember in scientific research or understanding we cannot ignore systemic observation or applied aspect of it. Homoeopathy is an undiscovered science. The responsibilities have to take the scientist worldwide. 1. If contemporary science is unable to explain the mechanism of action of Homoeopathy then who will be responsible for that! There are many observations in the different field of Nature in which contemporary science is a total failure to provide an exact explanation or conclusion. Should they all are considered to be wrong observations? 2. If Homoeopathic acts on the basis of Placebo effect then how it significantly works on children or animals? 3. If we cannot explain (within our own limitations) something should it be justified to deny the fact to hide our own failure or we have to rethink or think differently on this matter? 4. If Homoeopathy is nothing but a placebo then why WHO or Govt. is not banning this system of medicine? 5. There are many healing ways in the world. Then why only Homoeopathy is giving significant results. According to WHO Homoeopathy is 2nd most popular and used system of medicine worldwide on different critical illnesses. Why not other so-called "non-evidence based pathy" are not giving such good results? If the placebo effect is the backbone of Homoeopathy then all the other healing ways should give similar significant results. Chemists and scientists are concerned with physical and chemical properties of the medicinal substances but they are unaware of the therapeutic properties which are never quantitative but always qualitative in nature. Hahnemann always criticized this tendency to look for the treatment on the basis of physical and chemical properties of substances. Therapeutic property matters here. The world has not changed much from those times. We need your valuable opinion and suggestion on this issue, thanks.